New Yorker columnist Seymour Hersh harshly attacked President Obama and fellow journalists in comments from the summer published over the weekend. 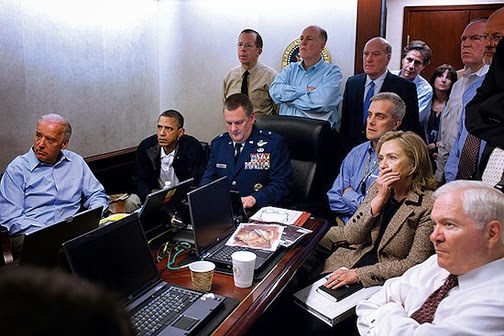 The White House released a now-iconic photo at showing Obama and cabinet reaction to a video of the 2011 raid. The Hersh comments caused a stir over the weekend in journalism circles, although he noted to me Sept. 30 that his remarks were from a lecture in July on investigative journalism, and were just now being reported. Lisa O'Carroll of the Guardian reported also that Hersh told his audience at the City University in London program on investigative journalism that most network broadcasters should be immediately fired to improve news coverage. The acerbic Hersh, born in 1937, is best known for breaking the story of the My Lai Massacre by U.S. troops during the Vietnam War. 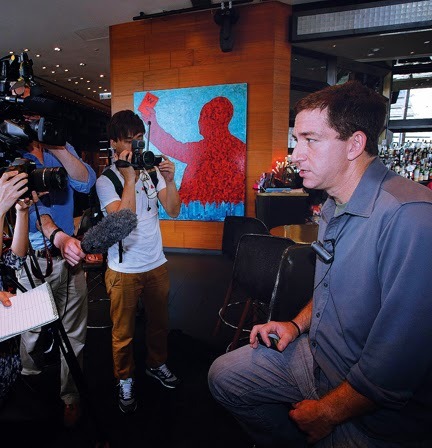 The London-based Guardian headlined her story Seymour Hersh on Obama, NSA and the 'pathetic' American media. 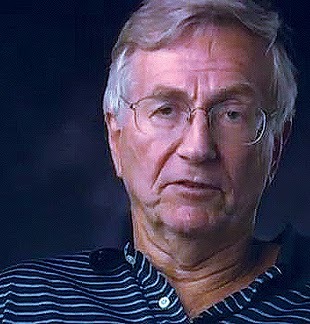 Publication of the Hersh comments comes at a time of increasing criticism of the White House, Congress, and the mainstream media. "Jeremy Scahill, a contributor to the Nation magazine and the New York Times best-selling author of Dirty Wars, said he will be working with Glenn Greenwald, the Rio-based journalist who has written stories about U.S. surveillance programs based on documents leaked by former NSA contractor Edward Snowden." Additionally, author and former NSA analyst Wayne Madsen reported Sept. 30 that the Navy War College in Rhode Island, which he attended as a Navy intelligence officer, is deeply involved in monitoring social media and using it to slant mainstream news coverage in pro-military directions. Regarding activism on other topics, Ralph Nader attacked those in Congress who ignore the plight of an estimated 200 Americans who die needlessly each day on average for lack of health coverage, according to a major study. Also as amplified below, Madonna released a video calling for a major worldwide campaign to promote artistic freedom. Hersh said he would describe details of the 2011 raid in a forthcoming book about intelligence services. 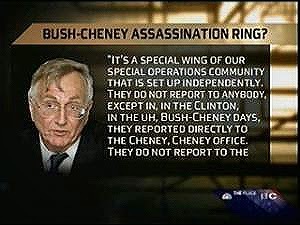 Hersh most likely on Bush/Cheney and now Obama "kill list"
Hersh is the first American journalist who primarily publishes with the corporate-owned mainstream media to air such an allegation to the best of my knowledge. Any discrepancies in the official story would implicate top leaders of the Obama cabinet. Among them would be 2016 Democratic presidential front-runners Hillary Clinton and Joe Biden, who are portrayed in the photo, as is the former Obama Defense Secretary Bob Gates at lower right in the photo. Other major Republicans would be embarrassed. So would leading news organizations and other major corporations. Yet others with significant media credentials have claimed for years on web media and radio talk shows that the raid was phony. One of those skeptics has been Madsen, a frequent commentator on major TV and cable news shows in years past. 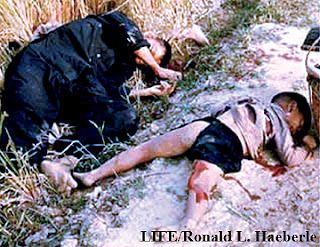 Another is former Wall Street Journal associate editor Dr. Paul Craig Roberts, an author and conservative scholar. Two others have been free market radio host Alex Jones and left-wing author Dr. Webster Tarpley. 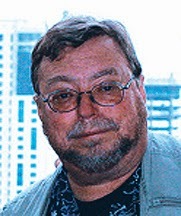 Their claims of inadequate or deceptive official government reports, including on 9/11, have brought heavy reprisals from major news outlets for the most part. Madsen, widely published as an op-ed columnist on less controversial topics, quipped Sept. 28 that Hersh should be prepared to have his Pulitzer taken back. Madsen has withstood a campaign of coordinated disparagement by a few anonymous trolls who have submitted hundreds of adverse edits onto his Wikipedia bio. Also, Dr. John Schindler, a U.S. Navy War college professor affiliated with the National Security Agency (NSA), has undertaken relentless efforts to influence the news. One non-controversial way is by appearing on cable TV networks. Another, which has a sinister dimension, to use social media to mock an array of others in public life. These include President Obama (particularly notable for and a Utah congressman skeptical of the NSA's domestic spy program, whistleblowers and journalists such as Greenwald and James Bamford who report on whistleblowers and spy programs, as I described in a three-part series this summer excerpted below. One of Schindler's special targets is Madsen, who has found his normal outlets hit by anonymous but clearly concocted protests of those arguing he should not be quoted or employed. Rear Admiral Walter "Ted" Carter, Jr.
Rather oddly, the leading society of editorial writers and other opinion writers, the Association of Opinion Journalists, has chosen to hold its annual convention near the War College's base in Newport, Rhode Island and bestow its highest annual award on Rear Admiral Walter "Ted" Carter, Jr., the college president who has presided over these kinds of faculty initiatives to mock and intimidate those in the media. The conference theme is water security, in which the college plays a significant role. No discussion is listed regarding press freedom or privacy issues raised by intelligence agencies dominating the news all summer following Edward Snowden's revelations.. The journalists' bestowal of their leadership award to Carter seems clearly in the realm of back-scratching to achieve access. 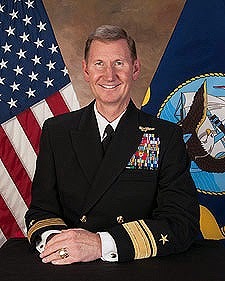 He assumed command of the war college on July, and would have been unlikely to have achieved momentous achievements in water security during the few weeks before the award was announced in mid-summer. The choice of Carter suggests either abject deference to the might, majesty and priorities of the military/security complex -- or a certain cluelessness to the behind-the-scenes struggles between the military/intelligence sectors and the vestiges of the traditional news profession. The ultimate prize? Control over commentary about major issues in an era when, more than ever, mainstream news coverage of war zones and secretive agencies is primarily by journalists whose access requires, in effect, approval on an ongoing basis by government leaders whose actions are the subject of news stories. Resisting that process are a few gutsy whistleblowers and columnists, including old hands such as Hersh and Bamford (author of three major books about the NSA) and a next generation that includes Greenwald. 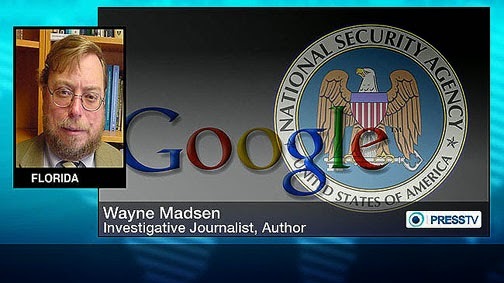 Another is Madsen, a commentator, alumnus of the War College in a certificate (non-degree) program, and former NSA analyst who supported Obama's election in both 2008 and 2012. Nonetheless, Madsen's challenge of the truth of the bin Laden raid undermined one Obama's major claims of first-term accomplishment, as well as the president's basic honesty and that of his cabinet. In 2011, Madsen described the raid site in Pakistan, Abbottabad, as doubtless familiar to bin Laden in the 1980s when bin Laden worked with Americans and would have known the locale as heavily infiltrated by Pakistan's Inter-Services Intelligence agency "and its CIA overseers" and U.S. Special Forces. Madsen wrote that special forces operated from the nearby Kalabagh air force base. "Why Bin Laden would want to locate a massive safe house in the heart of Pakistani and American counter-insurgency and intelligence activity is curious," Madsen wrote in 2011. The Pentagon has assured the public that they confirmed Bin Laden's identity through DNA sampling and are '100 percent' certain that the body they buried in the sea was that of Bin Laden. The question remains as to where Bin Laden's comparative DNA samples were obtained over the past several years when the terrorist mastermind was supposedly a phantom-like fugitive. However, the word from WMR sources at NSA is that no signals intercepts, from Pakistan or U.S. military sources, indicate that the man shot to death in Abbottabad was Osama Bin Laden. Such claims raise further questions about self-censorship, pack reporting and reprisals against reporters who provide independent analysis. The bin Laden raid held great symbolic importance for the nation and the Obama presidency. 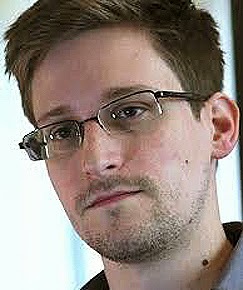 It was a centerpiece of news coverage and the major film Zero Dark Thirty when it was reported in the spring of 2011. Also, it was a centerpiece of the 2012 re-election campaign. But even GOP politicians have refrained from publicly disputing the bin Laden death. If problems arose from investigative reporting those missing the story could justify their actions by saying they have no one to quote if Republicans fail to dispute the raid. But that is a stenographer's role for the media that Hersh is right to reject. To my knowledge, no major reporter has ever insisted on obtaining thorough answers about precisely what the participants in the photo were watching. 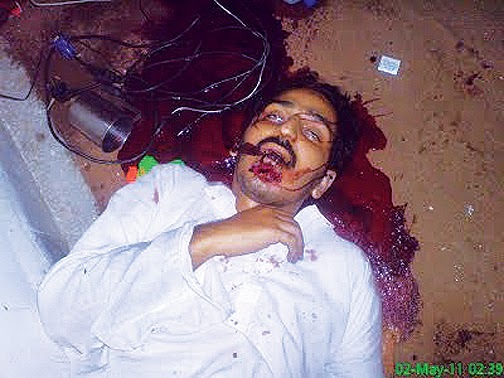 Nor have the major media reported why a DNA details of a positive ID of the raid's targets could not have been made public to assuage doubters who had long suspected that bin Laden died many years ago from kidney failure or an attack. The suspicion among skeptics is that bin Laden was kept "alive" in the popular imagination as a reason for continued war by the U.S. military/political establishment and their financiers of both parties. Defenders from both parties of official accounts denounce such criticism and questions as "conspiracy theory." 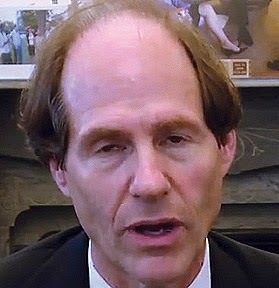 Obama adviser and friend Cass Sunstein, shown at left in a photo via Wikipedia, even advocated in a 2008 law review article that the government secretly hire journalists and academics to infiltrate professional circles to thwart such ideas. Sunstein thought such deception such a good idea that he boasted of it in an academic working paper. But that level of government-orchestrated deception would be proof positive of a conspiracy, just by itself. Obama placed Sunstein in charge of all federal regulation in the White House Office of Management and Budget, and hired his wife, Samantha Power, for a series of high-level posts. 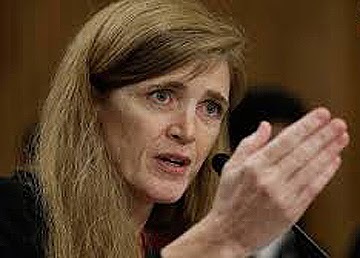 She is currently U.S. ambassador to the United Nations and at the forefront of seeking the bombing of Syria until the Russia-brokered plan to destroy Syria's chemical weapons. More recently, Sunstein returned to government as a member of the presidential commission to restore public confidence in the NSA following revelations by former NSA contractor Edward Snowden about its domestic spying program. 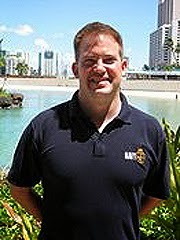 Author James Bamford and Madsen are among those who have exposed the program vast scope and privacy violations for years. Snowden's extensive documentation via reporting by Glenn Greenwald of the Guardian and Barton Gellman of the Washington Post gave the privacy violations wide exposure beginning in June. My new book, Presidential Puppetry, focuses upon this and other important stories long under-reported, but not the Obama raid. I knew of the skeptics but was not in a position to nail down that particular story, in part because of the unprecedented secrecy now enveloping every kind of major military and intelligence story. 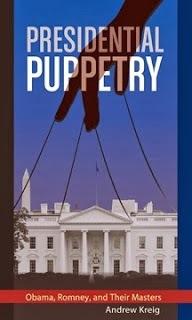 Puppetry makes the overall point that stories involving national security are becoming off limits for the media except for a few hand-picked reporters, who often are selected because of their cooperative demeanor to receive leaked government information shared with the rest of the media and public in ways that are unverifiable. It's not possible for one reporter, even one of Hersh's stature, or book to examine all such mysteries. But every book and serious journalist should appreciate that it is high time to recognize that a crisis in self-censorship is occurring. 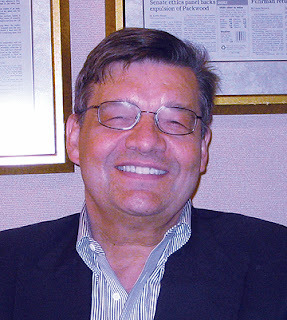 I am in the process of organizing two high-profile panel discussions, one in Washington and one in New York City, whereby top reporters who dare to report on such matters can present their latest findings and thereby make possible wider coverage from peers operating under self-censorship by top management reluctant to antagonize news sources in government and financial backers of their news outlets. One of the biggest hidden stories is that news organizations, at the highest levels, are intimidated not by government and advertisers, but more importantly by ownership interests that can overlaps with donors to politicians and the biggest advertisers. Hence the concept of "puppet masters," or "Wall Street" or similar shorthand names. Andrew Kreig is Justice Integrity Project Executive Director and co-founder with over two decades experience as an attorney and non-profit executive in Washington, DC. An author and longtime investigative reporter, his primary focus since 2008 has been exploring allegations of official corruption and other misconduct in federal agencies. He has also been a consultant and volunteer leader in advising several non-profit groups fostering cutting-edge applications within the communications industries. In 2008, he became a senior fellow with the Schuster Institute for Investigative Journalism at Brandeis University and an affiliated research fellow with the Information Economy Project at George Mason University School of Law.